After my blogging streak last night, got inspired to blog more tonight!!! I just bought a new "work" table (on sale at SM Hypermart haha), placed it at the corner of my room and now I'm feeling more inspired to blog! I realized I feel more burnt out when I try to do online tasks while lying down in bed. Not a good idea. Trust me. Haha. I either end up dozing off or watching a movie nalang hence accomplishing nothing. So, a table is really the best way to goooo. I'm still busy though. This is hell week for me until early next week. I've got meetings, pullouts and shoots. Haven't had a good night sleep for days now. I just recovered from a bad headache. Again. Boooo. Anyway, here are pretty recent outfit photos! I have never worn sneaker wedges in my life, but that didn't stop me from trying it out even just for a day. It's comfy as hell pala! SKECHERS sent me a cute pair from their new collection and here's how I styled it! This is the best way I could style this pair while keeping true to my personal style--vintage! Lakas maka 90s db? 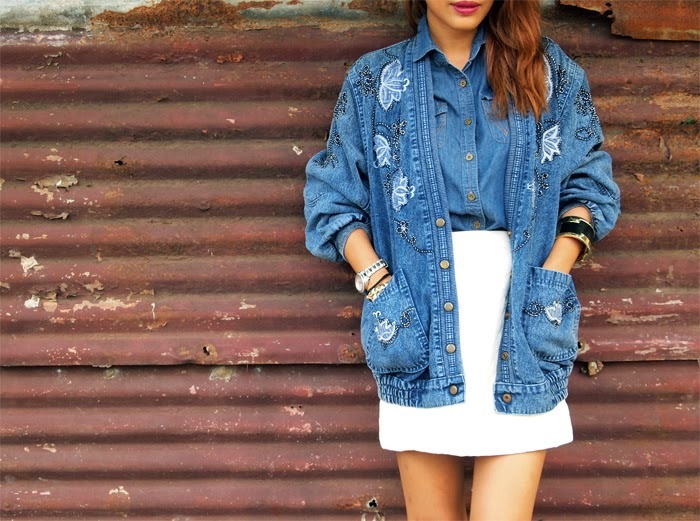 Denim on denim na oversized jacket pa... complete with embroidery and beads. Haha. I think the shoes would also look nice with leggings and then oversized polo or shirt. Nooooh? I'll do that combo next time. Kaloka HAHAHA!!! I was actually in my bed while I was reading this, tas when you said na mas nakaka motivate mag blog pag naka table, I went to my study table na tuloy. And yes! You're right! hehe. Love your outfit!!! 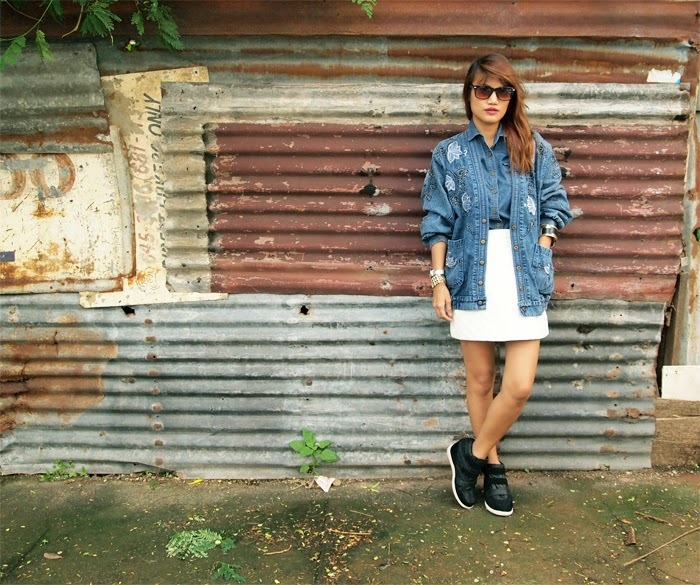 Super love the denim look! And the wedges are love love love! PS. HAVE YOU JOINED MY AZTA OMBRE HAIR MAKEOVER GIVEAWAY?